I will be leaving Sussex and The Priory very soon. 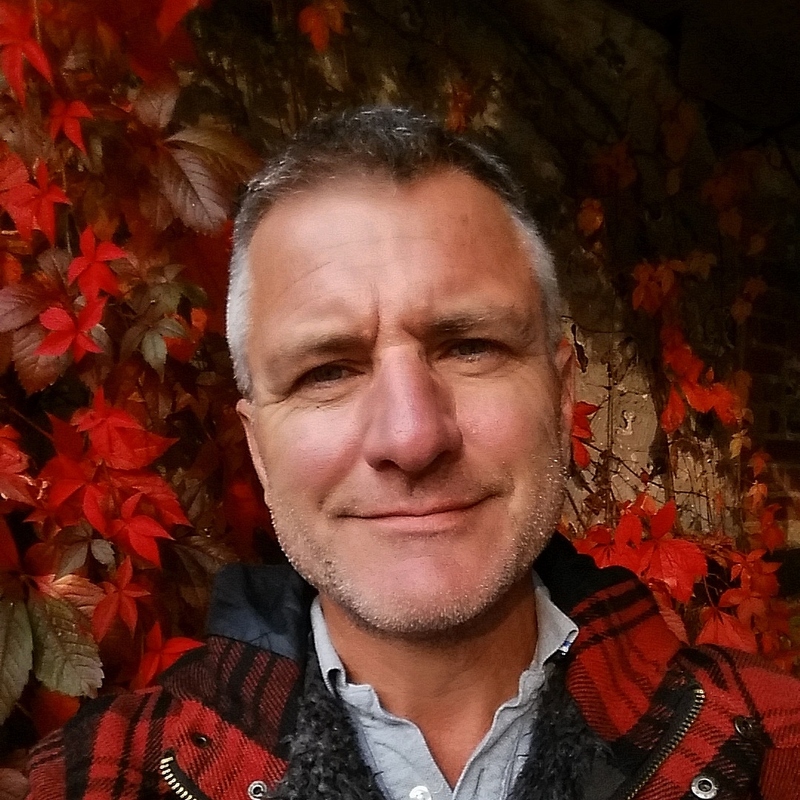 And if I’m excited about my future life in a different part of England, my lower lip trembles sometimes at the thought of leaving this garden; a garden in which I’ve spent hundreds and hundreds of my days. (By a rough calculation, more than 1500). I’ve been so busy selling a house here and buying a house in Gloucestershire, that I’ve neglected to show you The Priory during her best time: May and June. 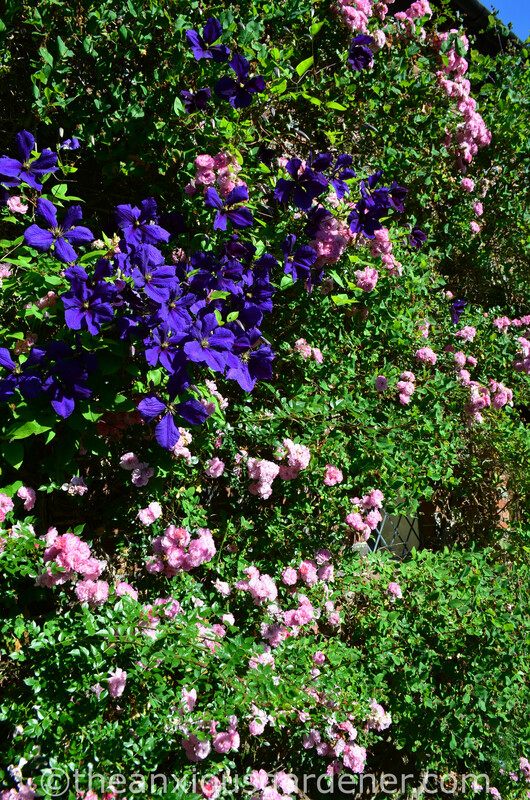 But then, as I was walking about the grounds last week, I noticed so many pretty things, so much darn flower that I paused, slapped my forehead and ran for my dusty camera. 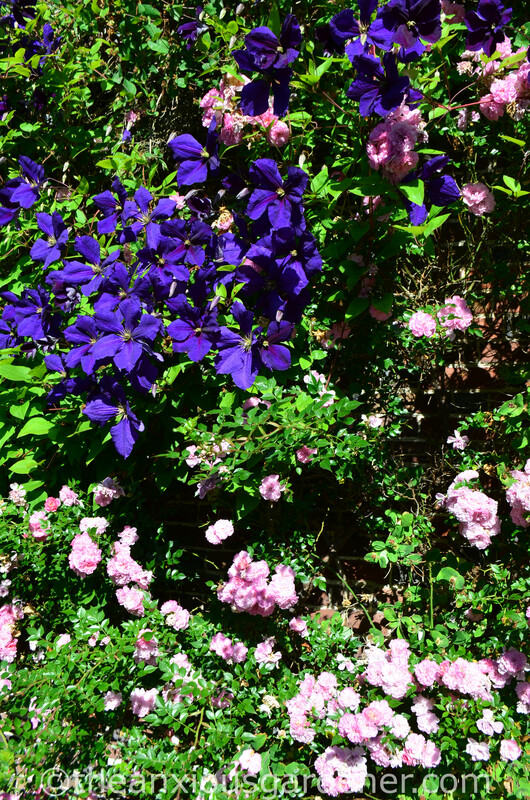 Here’s a little – mostly rose and clematis – of that Priory June colour. 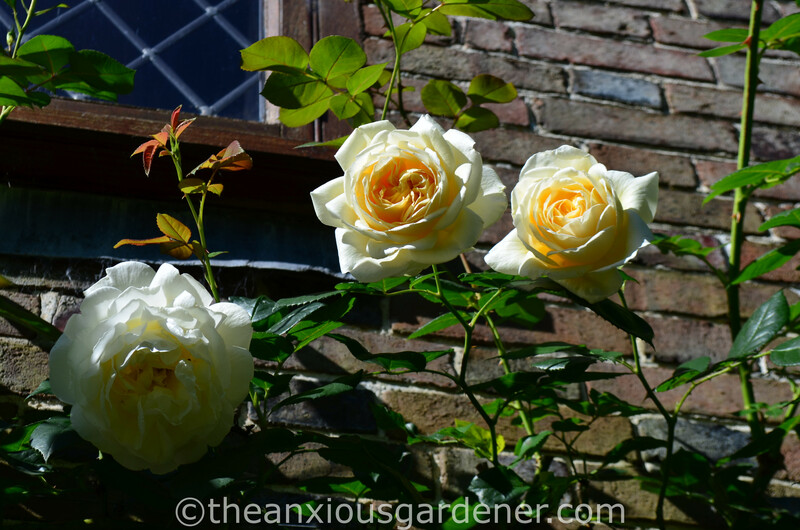 This Rosa ‘New Dawn’ was growing by the front door on the day I started work in 2008. I haven’t done much to it other than train it upwards and along the flat leaded porch roof. I don’t even feed it but, despite neglectful care, it flowers heartily and gives a warm welcome – to non-existent visitors. 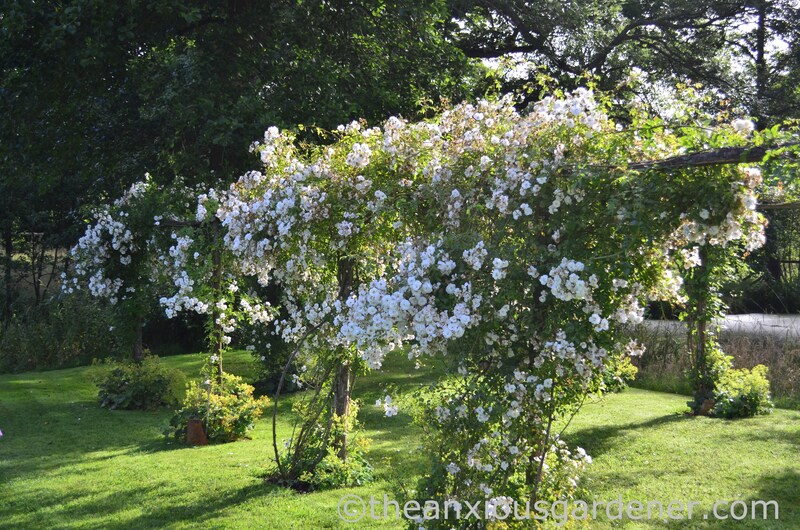 Whereas, Rosa ‘Madame Alfred Carrière’ I did plant. It grows above the kitchen door and window in almost perpetual shade, barely suffers from rust nor black spot and bears heavy, fragrant, repeat blooms. 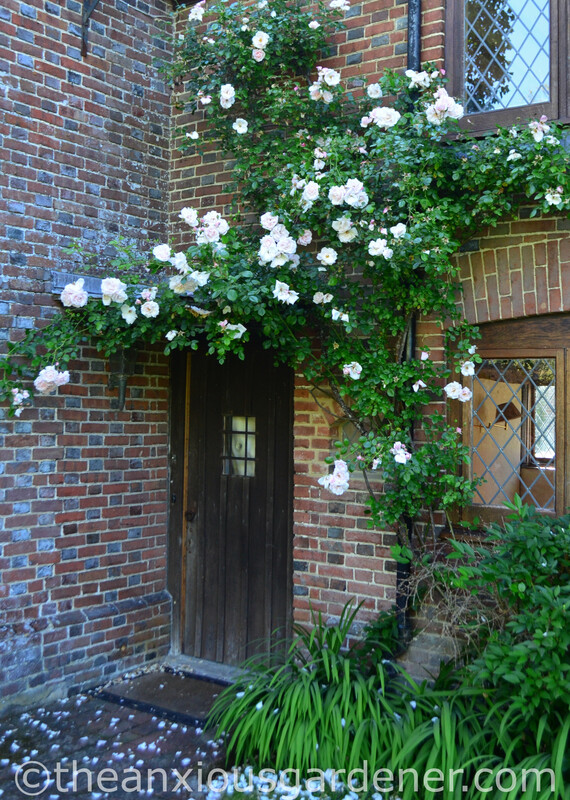 My kind of rose and perfect for this north facing wall. 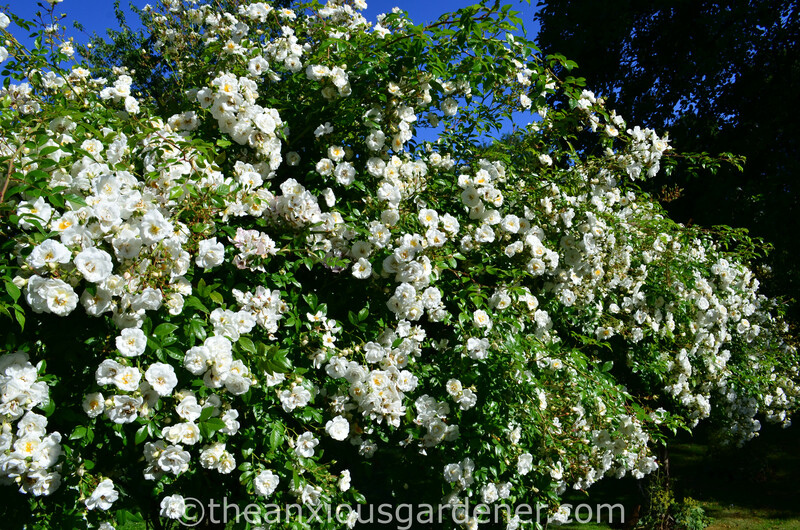 On the rose tunnel, R. ‘Sander’s White‘ is a big fat show off. This is not an understated rose. 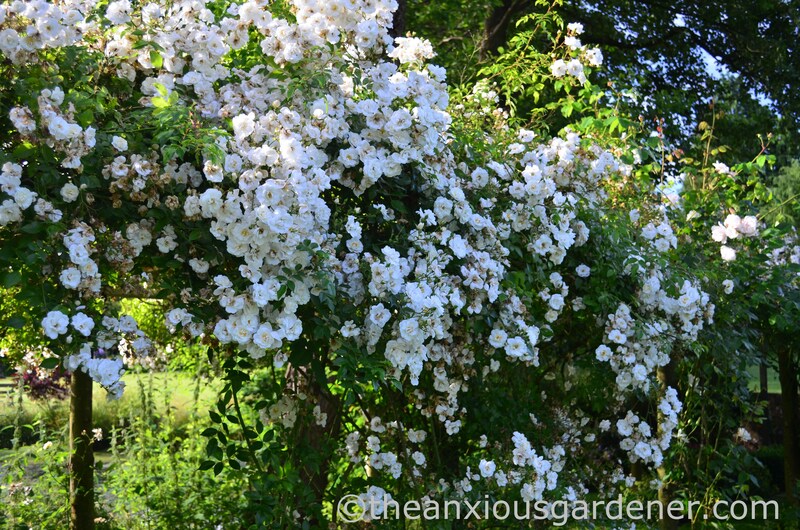 It has a superabundance of blooms with a scent that punches you in the nose – in a playfull way. 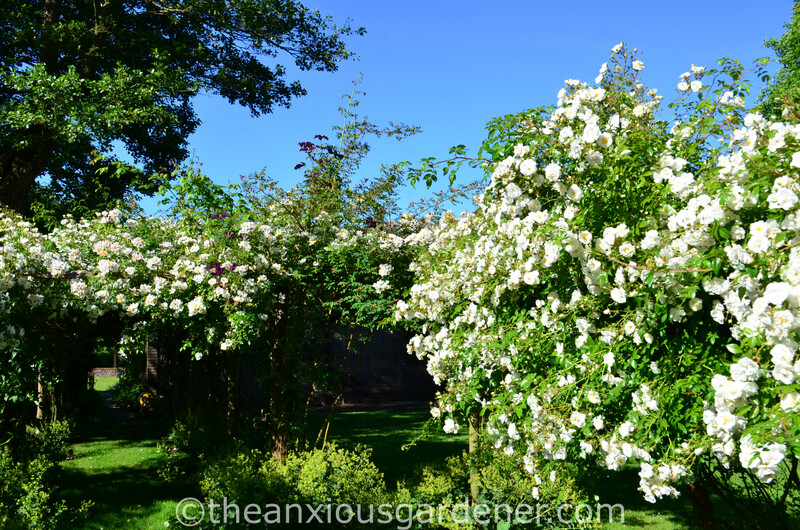 For a few days in June, it flowers quite delightfully, quite madly. 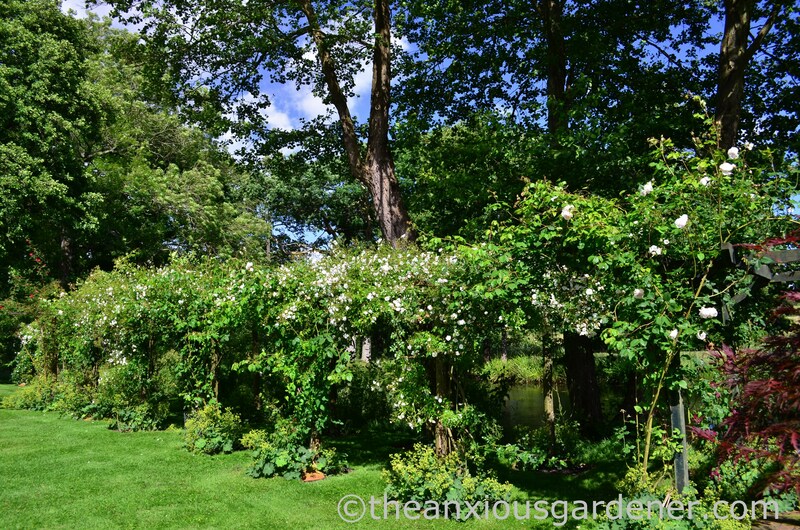 As you probably know – if you’ve been reading my record of a Sussex garden for a while – I grow several different clematis in amongst the roses on the tunnel. The Sander’s White is a short-lived phenomenon after all. 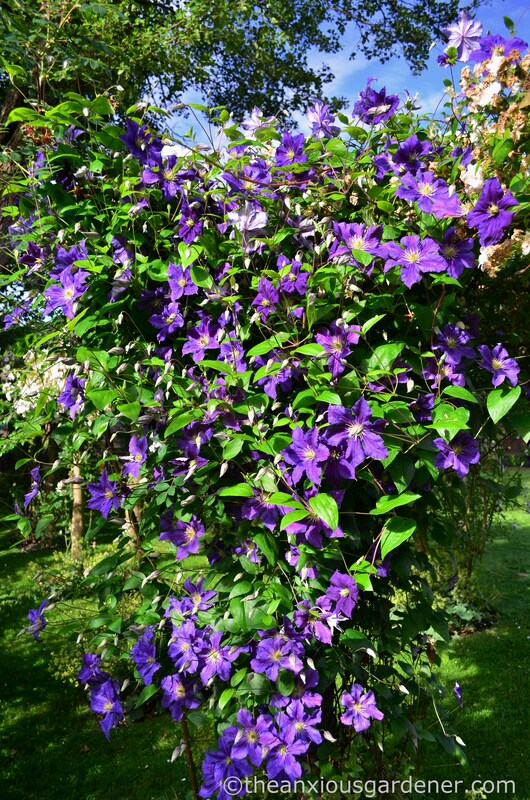 The large flat plates of Clematis ‘Warszawska Nike’ is one of fifteen varieties of clematis here. 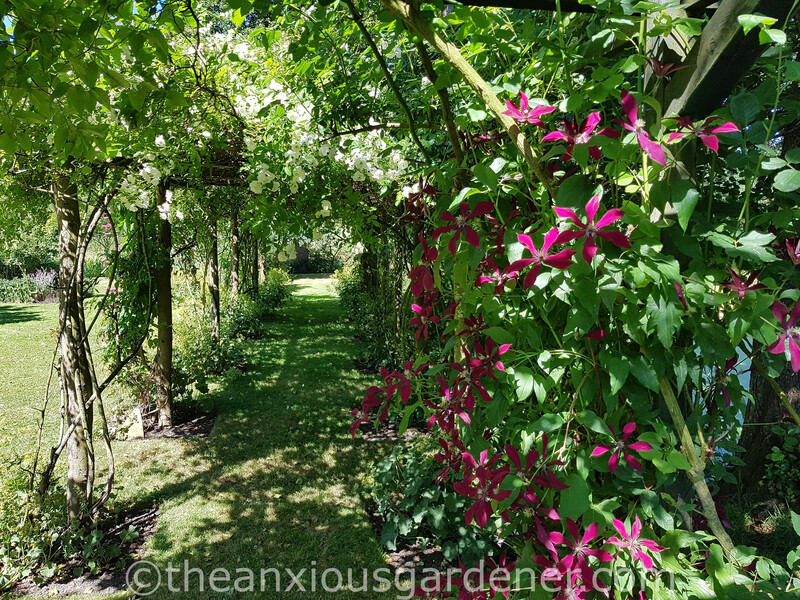 Conventional wisdom would have me prune this pruning group 3 clematis* each spring to 6-8 inches above ground level but I’ve learnt that doing so presents beak-level, tender new shoots to hungry pheasant. So, I don’t do that. No. 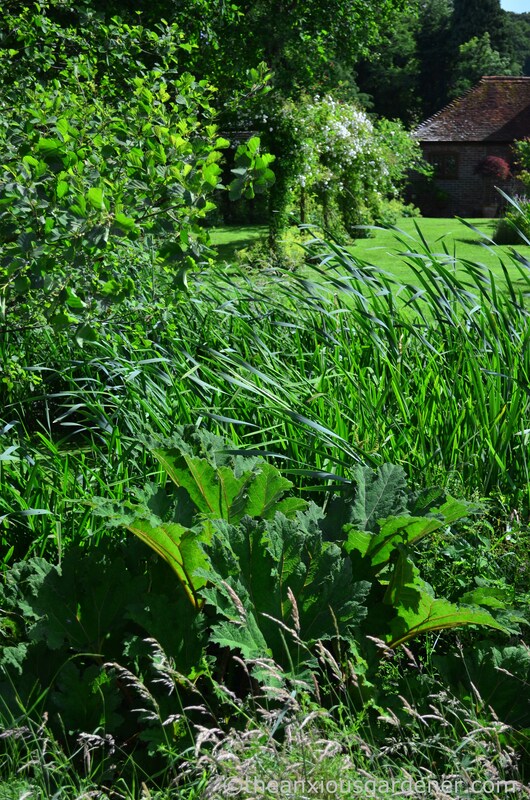 I cut back to a pair of shoots at about 3 or 4 feet – out of reach of pheasant and also beyond concerted slug attack. 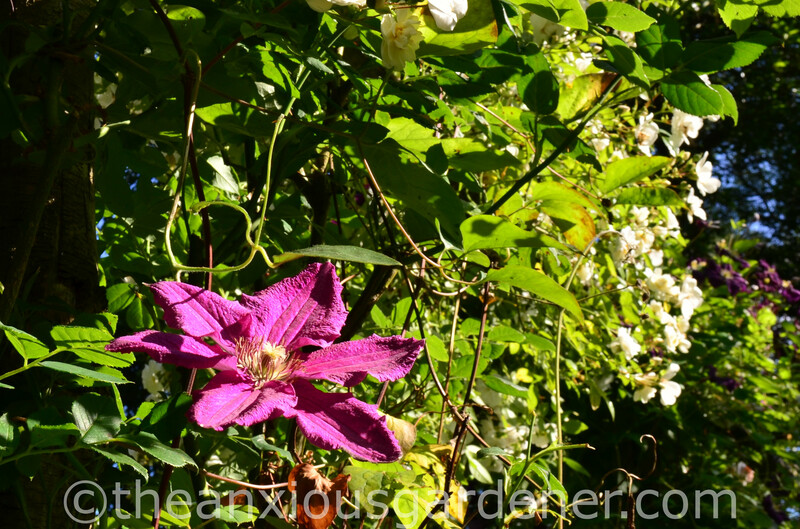 The clematis grows taller too … with its flowers intertwining amongst the roses rather than staring at my navel. 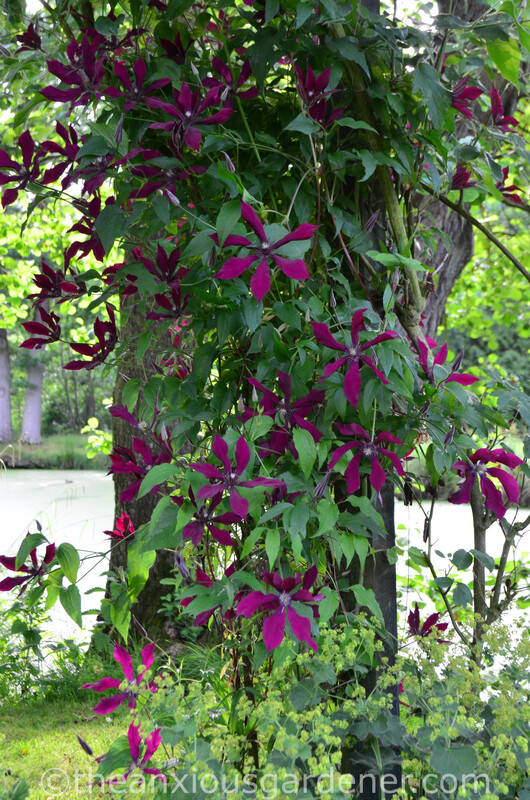 Étoile Violette bears lots of deep, purple flower and eventually scrambles far above the regular attention of deer. This year, the deer damage to trees, shrubs and er, most things actually, has been particularly bad. On a shadier tunnel post, is C. ‘Princess Diana’. She’s a gaudy pink but I forgive her that – given the beautiful tulip shaped flower. No deer attack on this one yet. 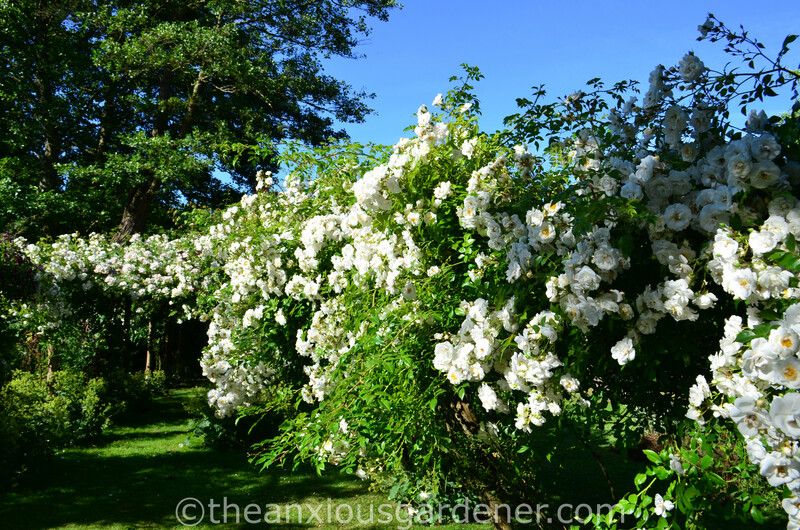 filling the bare stems of climbing roses overhead. 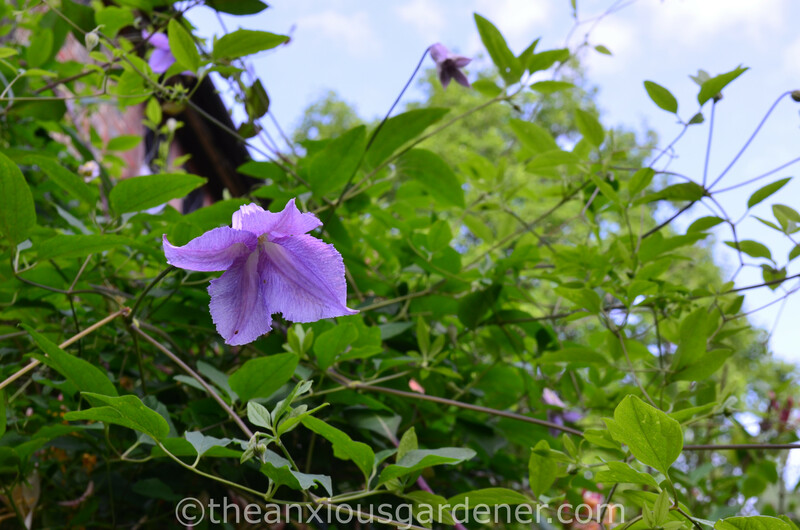 C. ‘Empress Amy Lai’ is pruning group 2. I moved C. ‘Crimson King’ from elsewhere in the garden. 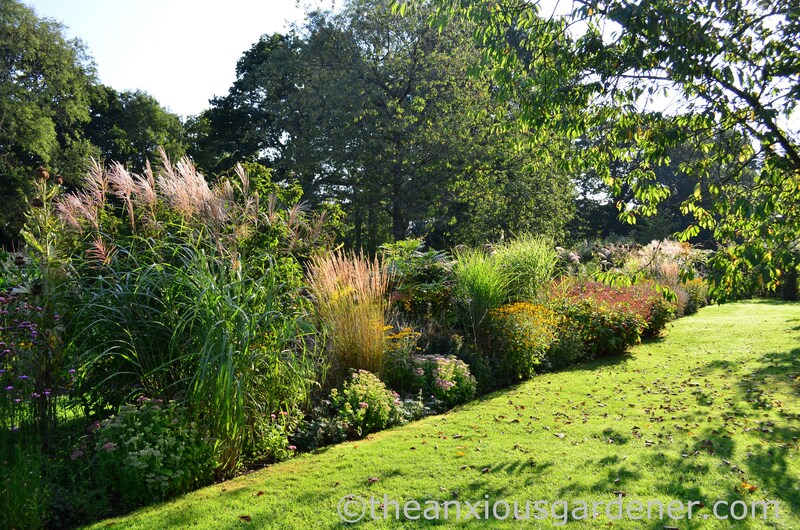 It struggled in the long border with competition from so many herbaceous plants and is much happier here. But it ain’t crimson. Group 2.
and deftly hiding an old, ugly chain link fence near the house. Also group 3. 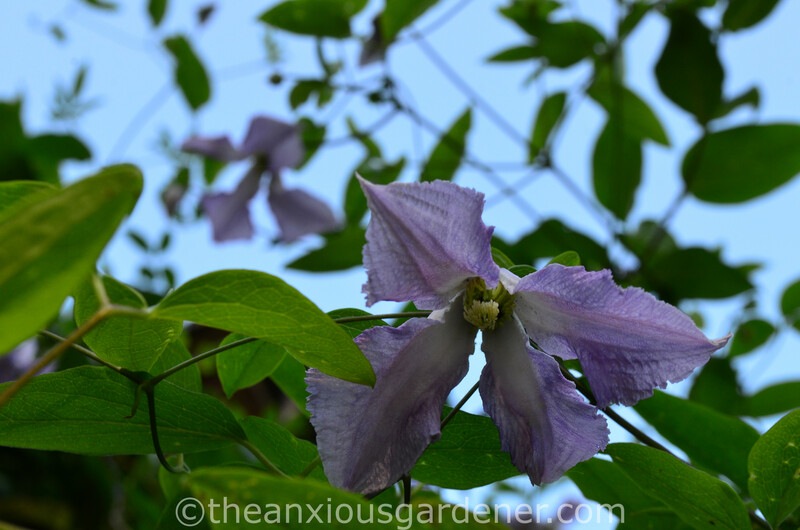 I really like another newbie – Clematis ‘Roko-Kolla’ . 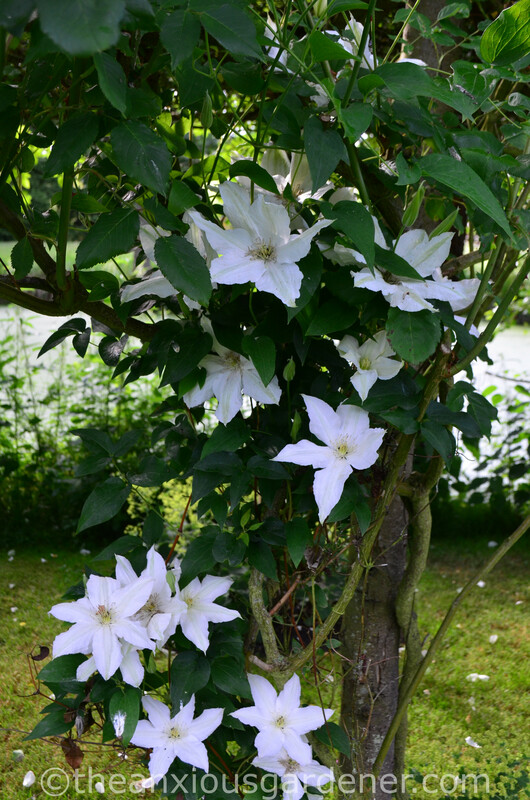 It bears large white flowers with subtle green stripes. Another group 3 but you know by now my feelings about pruning back hard. as foxgloves fade away. 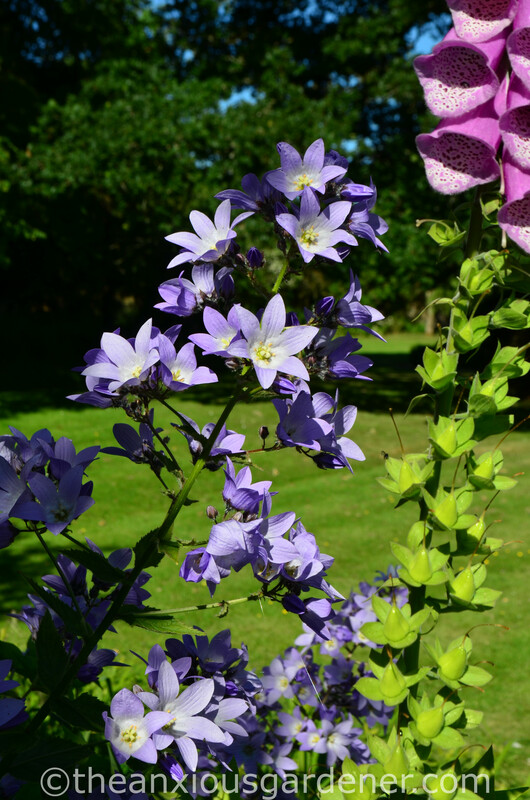 This is a splendid, large plant with several impressive flower spikes, forming an excellent centrepiece for a June border. At least, that’s what I think. 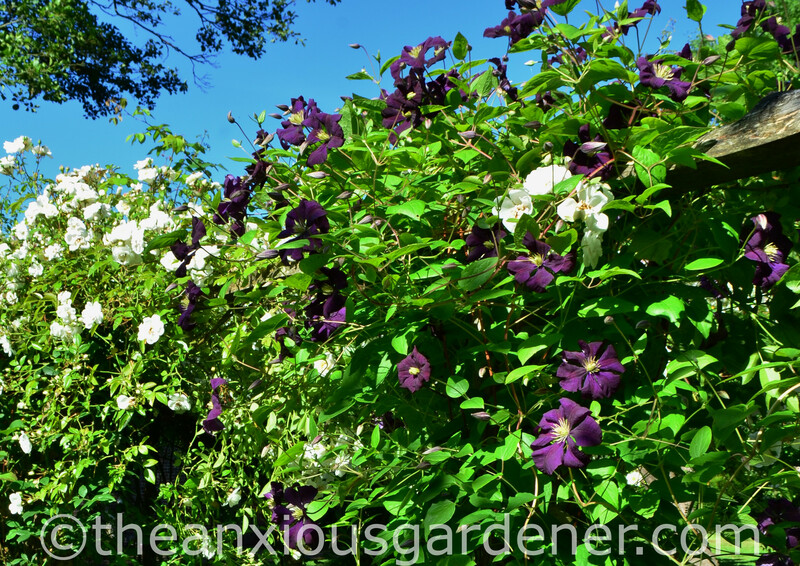 On the east wall of the house is another clematis, Clematis Jackmanii. 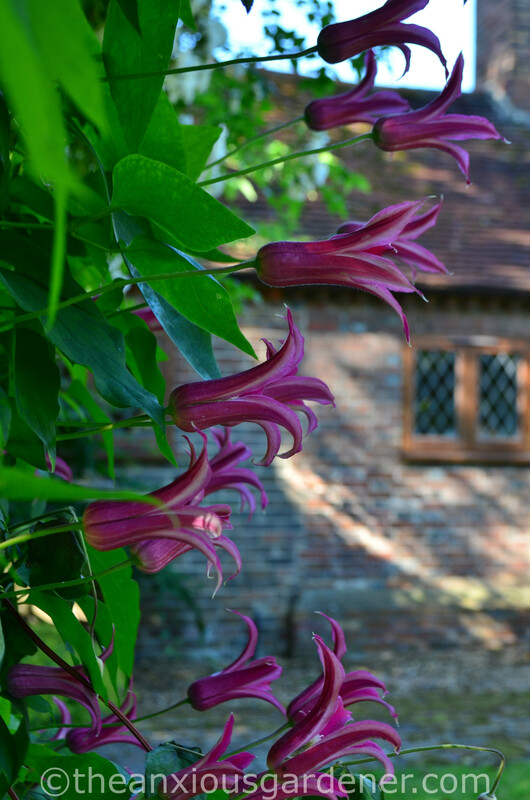 Growing through a rose (variety unknown), this is the only Priory clematis I didn’t plant. 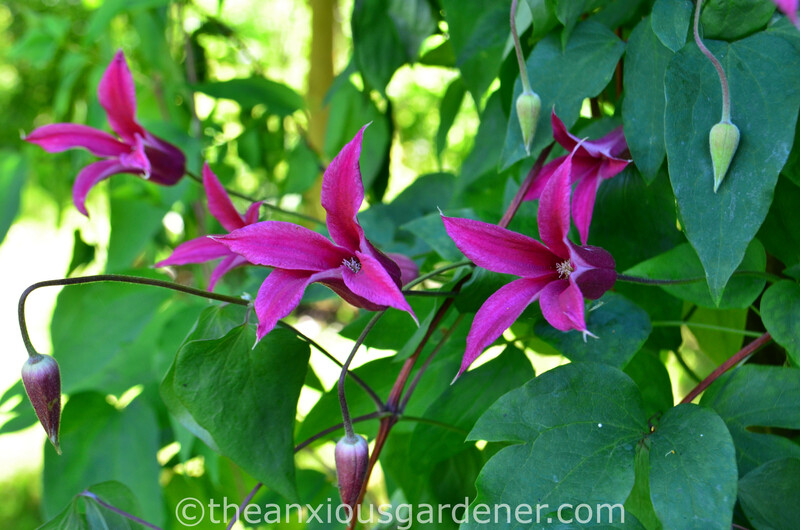 I keep its roots well shaded (clematis don’t like their roots sun baked) and tuck in shoots that otherwise wave around in the air. A vigorous plant with a good bold colour too. Pruning group 3. 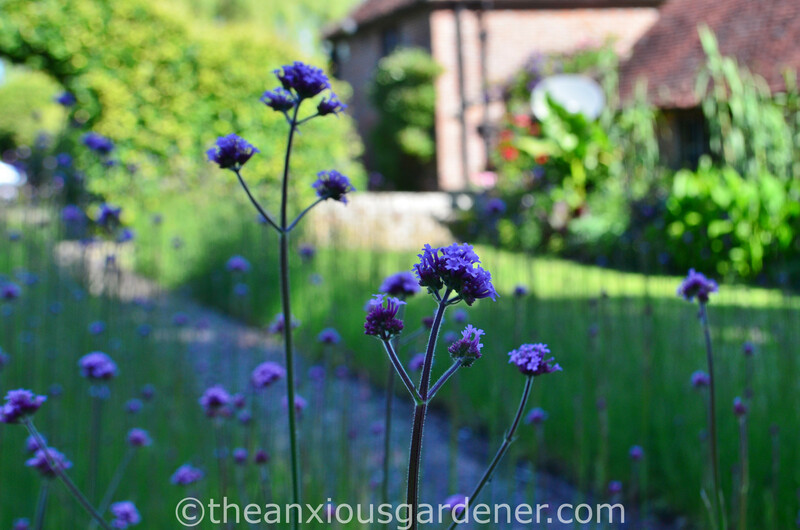 My two twelve metre Verbena bonariensis borders are just coming into flower. I don’t normally water them but June and July 2018 have been shockingly dry and I’ve relented. I should hate to see this spectacle shrivel and turn yellow before I leave. It’s a funny job mine. I tend a big garden which hardly anyone ever sees. What’s that about? A week can easily pass without a visitor and now that the house is empty, the owner won’t be coming back. Plants flourish (or don’t), flower (or don’t), and fade away, with only me as witness … with sometimes you too, of course. But I do have guests of a sort. 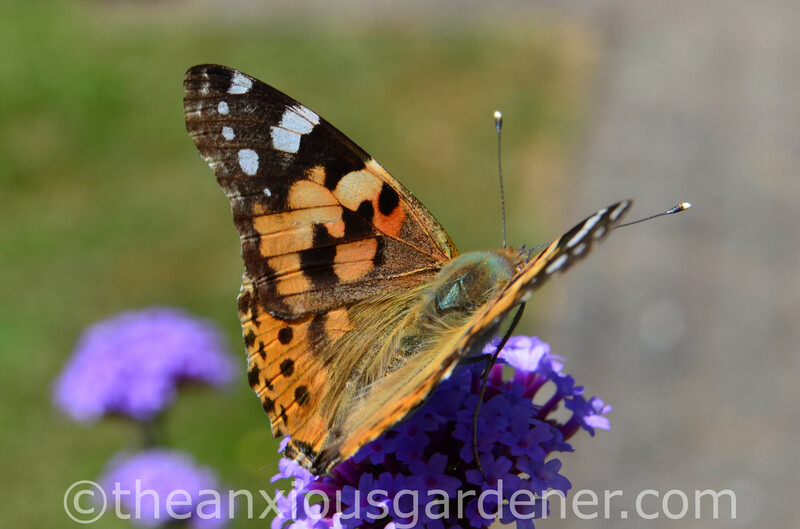 If butterflies, like this Painted Lady, and bees and a host of other insects are attracted to something that I plant, then … well, hell. I must be doing something right. 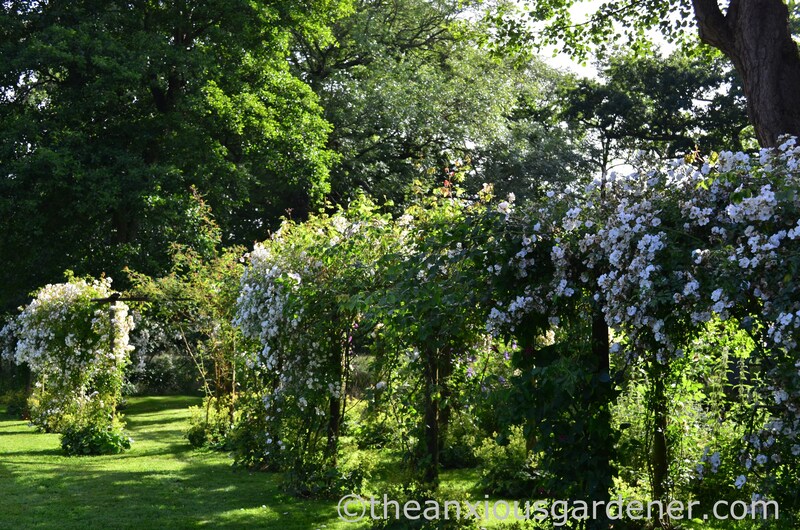 Attracting wildlife to The Priory has given me a huge amount of pleasure and satisfaction over the years; so much so that this morning, I watched a doe standing in the shade of the rose tunnel. 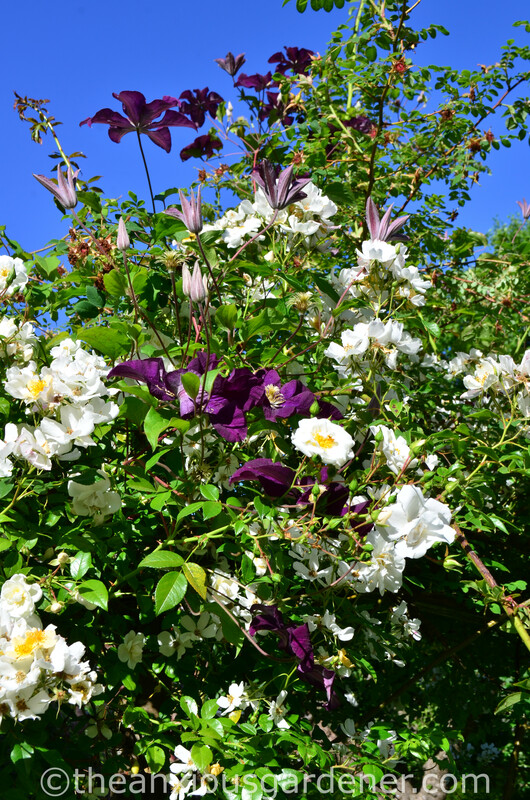 Rather than frothing with rage at chomped roses and clematis, her lithe beauty filled me with awe. 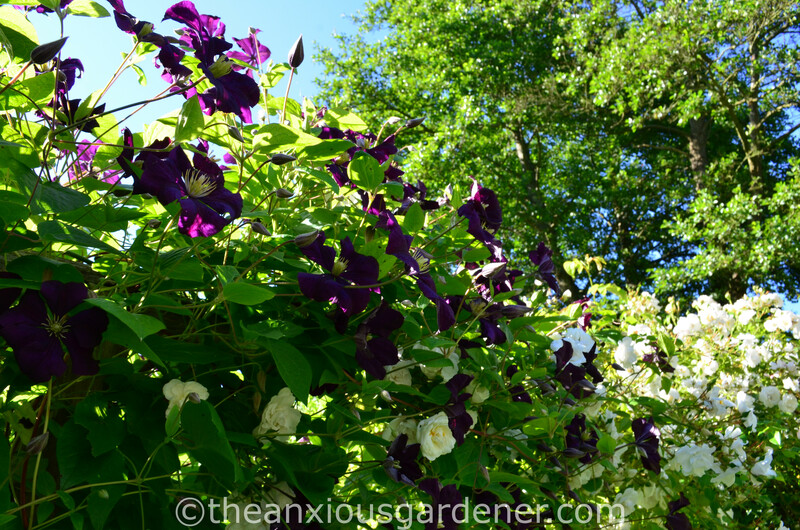 Group 1 – flowers on previous year’s growth and needs hardly any pruning. Tidy up as necessary and reduce in size if it gets too big. If it does need hard cutting back, do so right after flowering. Group 2 – flowering stems produced from previous year growth. 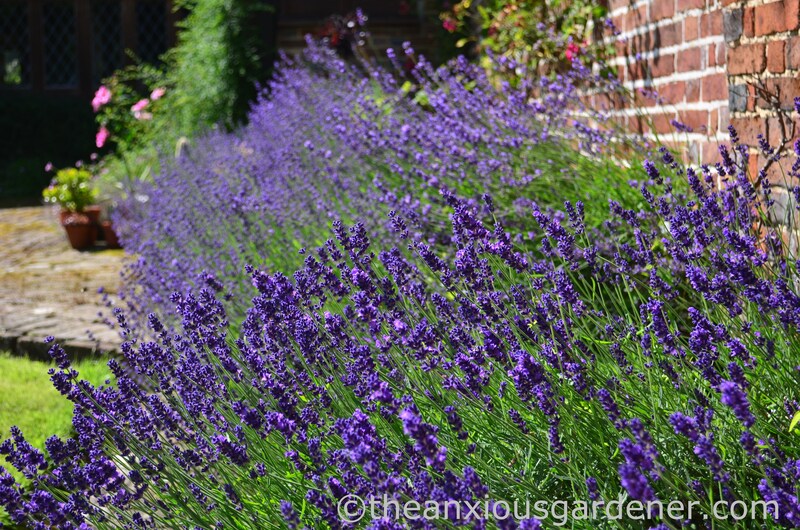 Cut back weak, damaged stems to a pair of strong buds in late winter. Tie in stems to form a framework in summer. Group 3 – flowers on current year’s growth. 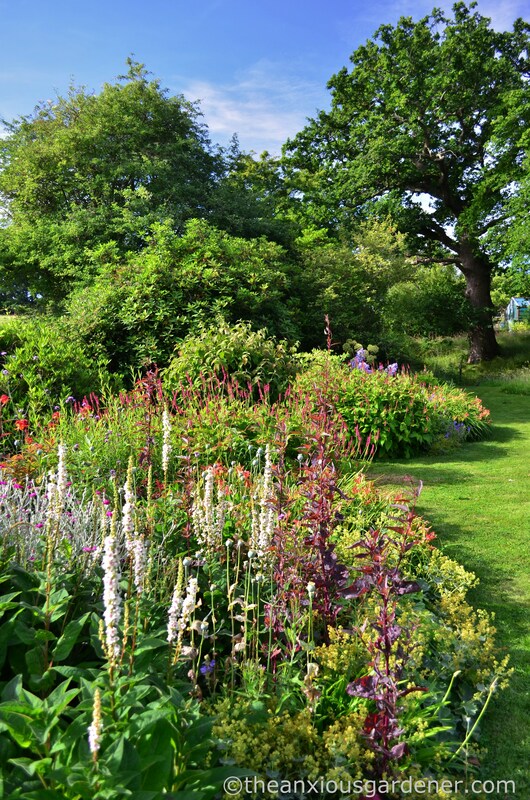 Cut stems back to a pair of strong buds in early spring, a foot or so above ground level (if you’re pheasant proofed). Summer has almost passed me by and, oddly, I haven’t posted any photos of The Priory since the spring. So as a belated companion piece to my recent tour of The Old Forge, here’s a look at The Priory during July – if only two months late. 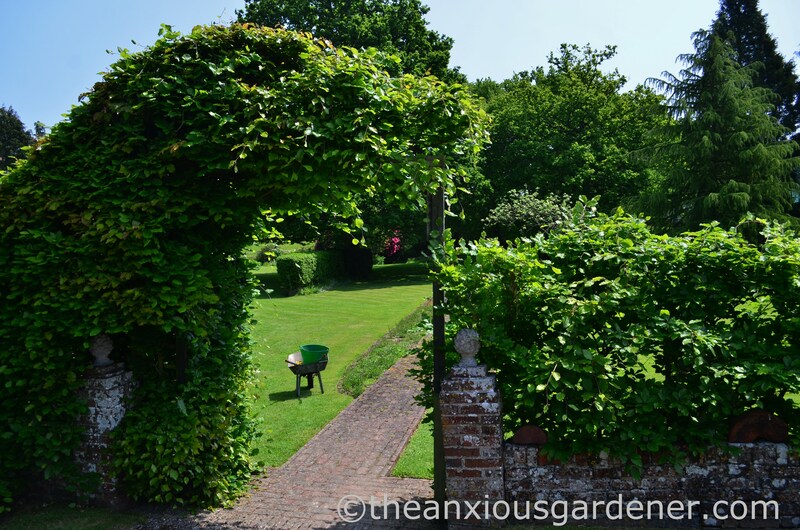 We’ll start off in the car-park, again, and enter the gardens under the youngest beech arch. 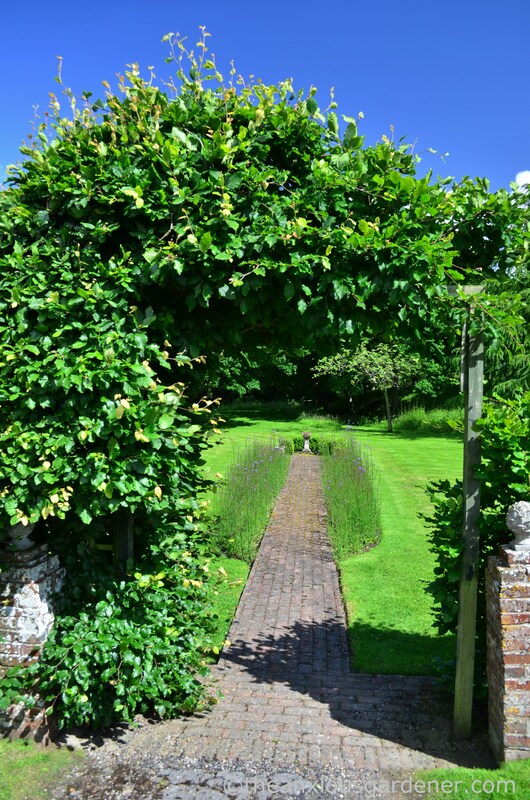 I’ve trained this for about five years but the new length of hedge to the right still isn’t quite high enough to meet the arch (trained from the established hedge on the left). 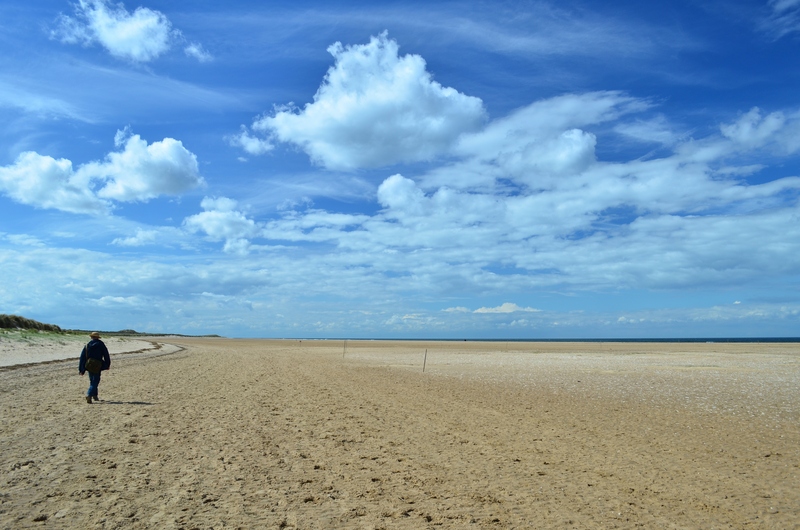 This photo from June shows it better. I’d hoped that the arch would be complete this year but we’re not quite there. Perhaps next year. 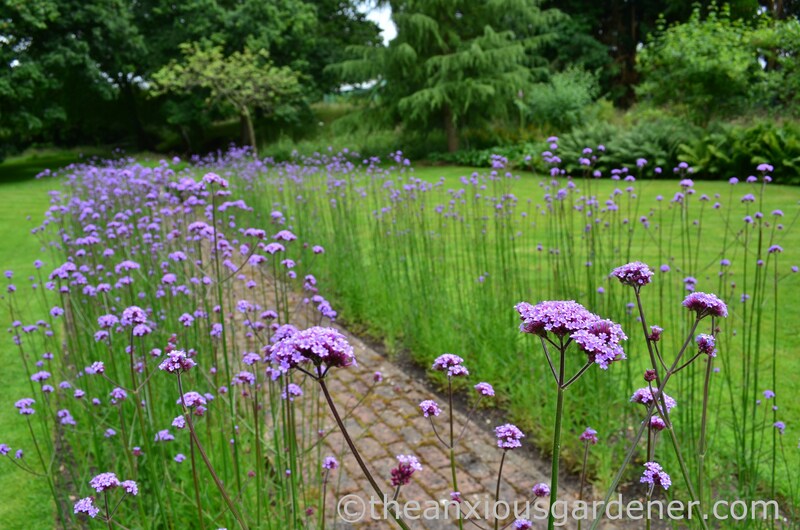 Directly ahead, on the-path-to-nowhere, are the two Verbena bonariensis beds. 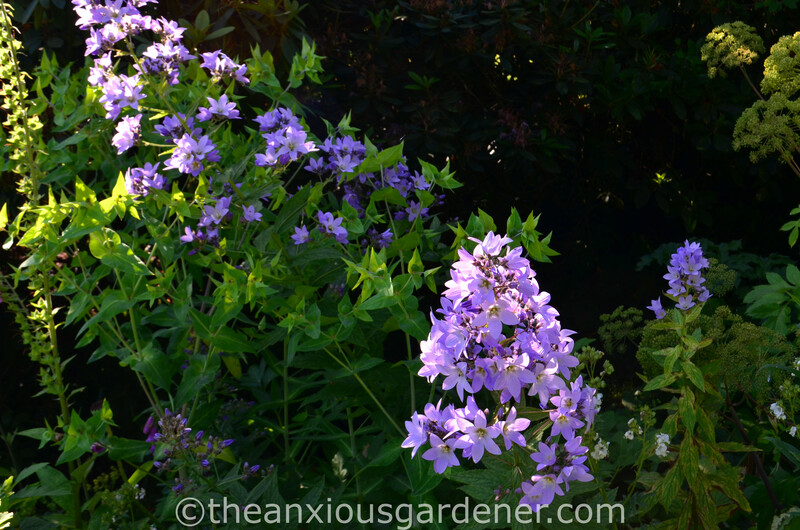 I’ve mentioned these often enough and will only say, once more, how simple they are to grow and maintain. I also bang on about them being a brilliant draw to butterflies … but not in 2016. 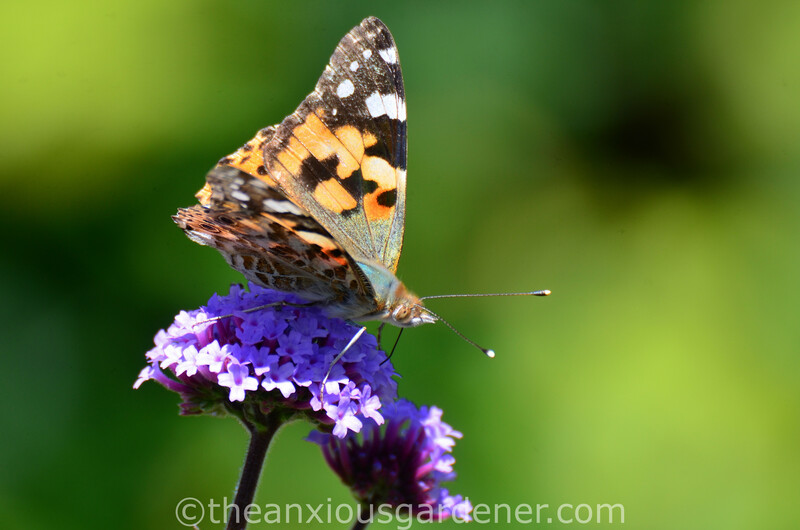 Has anyone else noticed far fewer butterflies this summer? 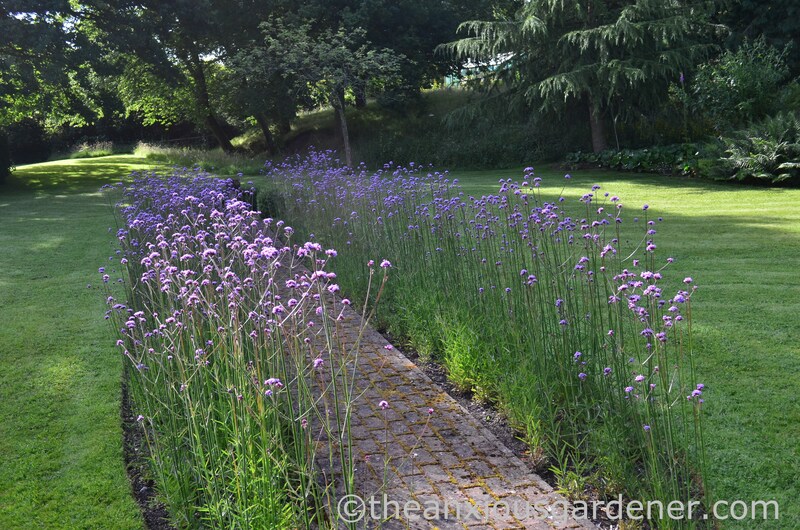 Changes in the garden are afoot and the Verbena bonariensis block planting might be done away with – or at least moved elsewhere. 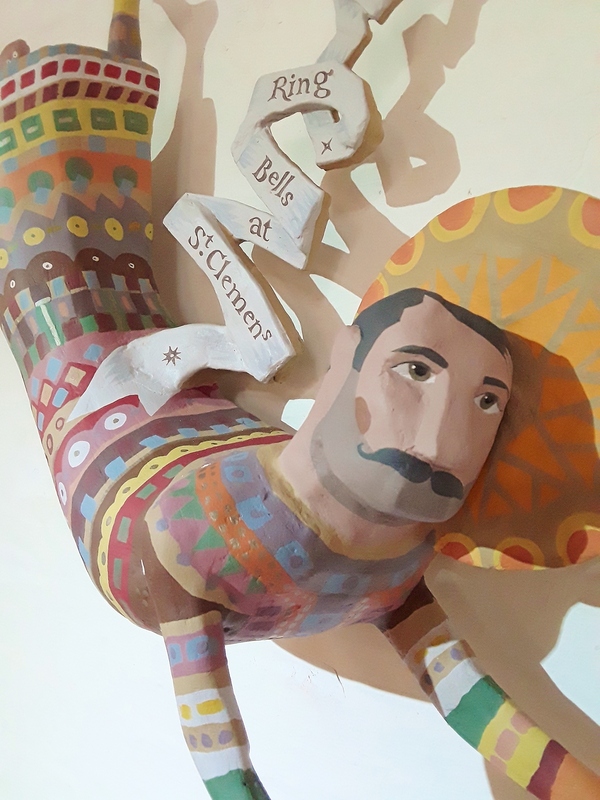 Update in due course. 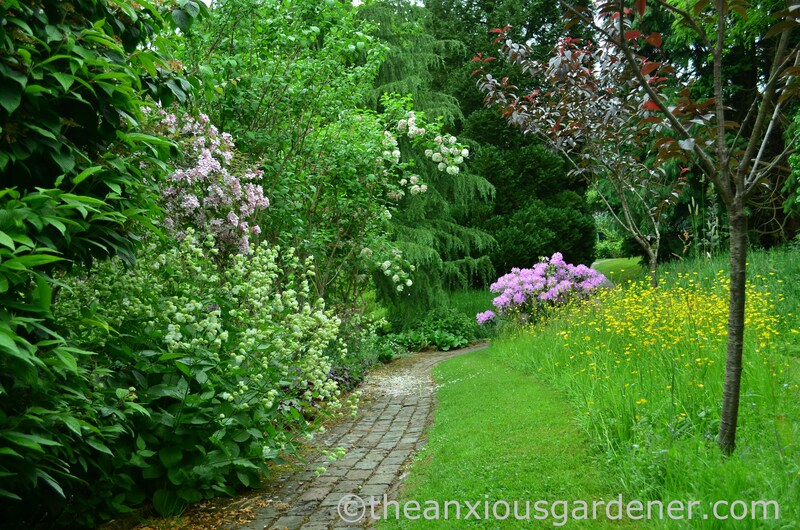 To our right is the Rock Border which is primarily a spring border and mostly at rest in summer. 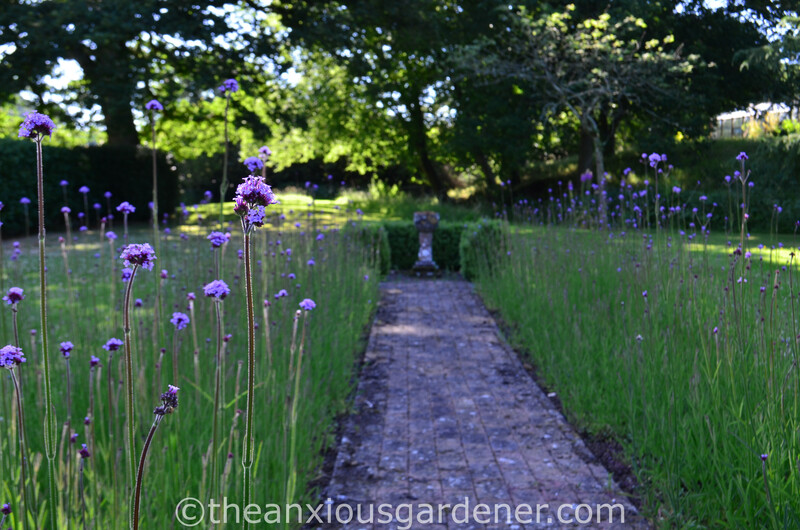 and here’s a sneaky peek at its June backside (from the path leading to the greenhouses). 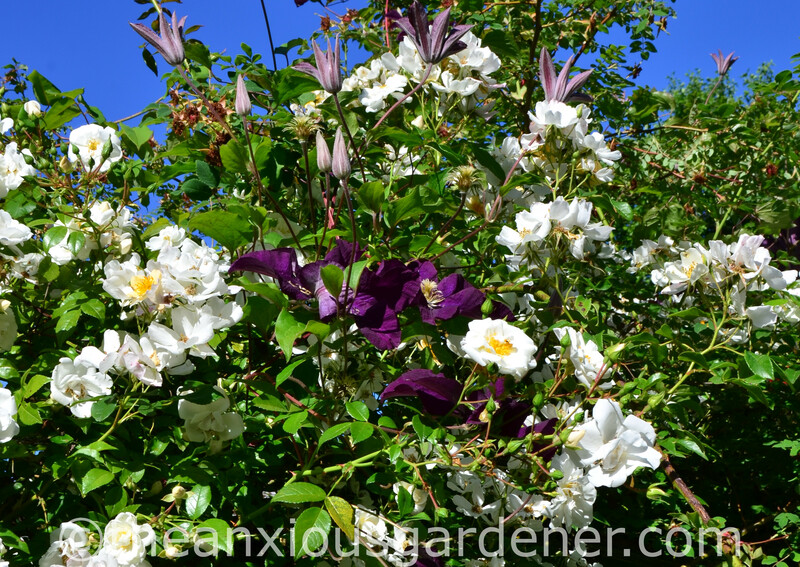 The ‘Roseum’ is still in flower; as is a pink weigela with gorgeous Silene fimbriata below. 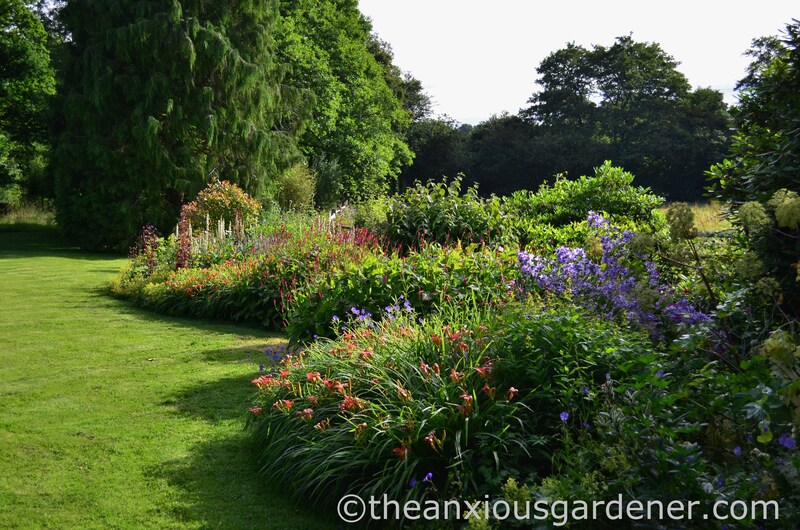 To our left from the beech arch is the Tropical Border just getting under way in July. I’ll do a post about that soon. 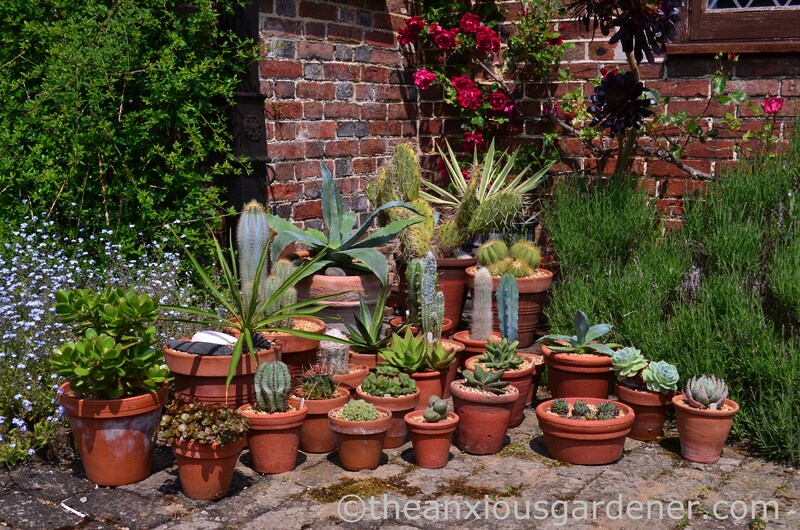 and beyond that, I hide an old drain cover with pots of succulents and cacti wheeled out from the greenhouse. I bring these out in April or May to bask in this hot, south-facing corner until September/October when they return under glass. 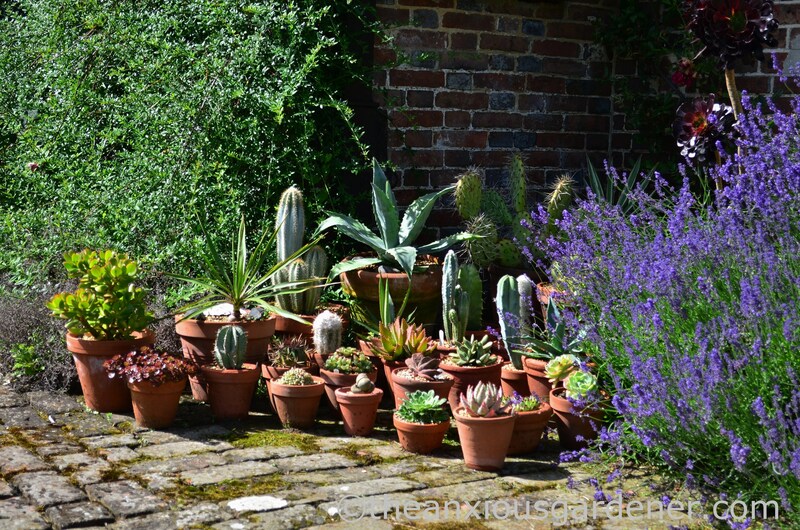 By then each pot will be home to a host of forget-me-not seedlings too … but weeding those out is a pleasant enough task on a rainy morning, in the greenhouse with the radio and a mug of tea. Turning our back on the house, we’ll cross the east lawn to where, against one of Margaret’s fields, sit the Kidney Beds. 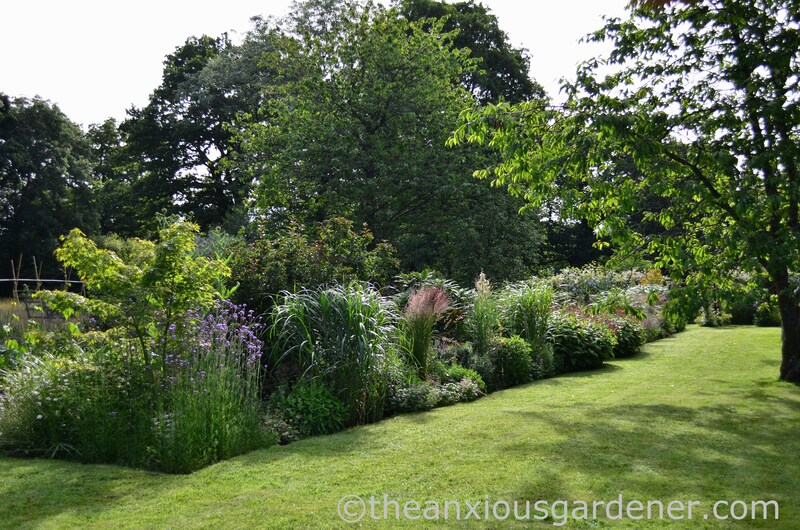 I’ve struggled with these borders over the years … if always with the best of intentions to “sort them out”. 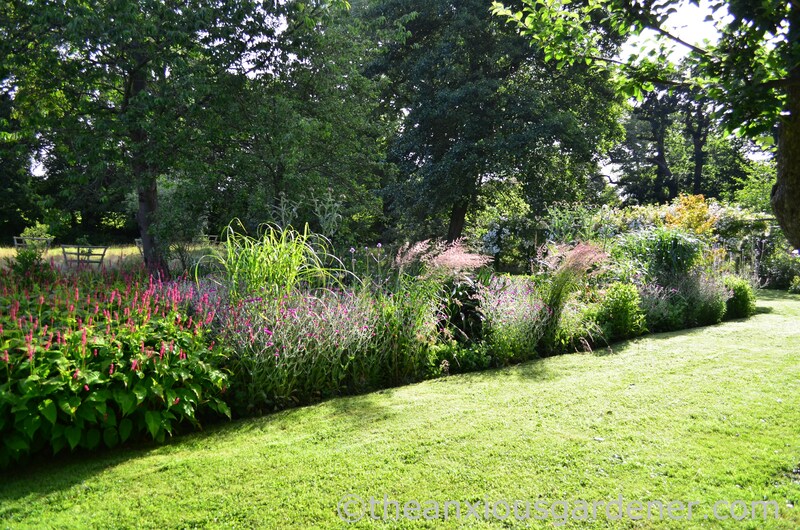 They are the least visited borders in the gardens and readily slide down the pecking order in my weeding and general care schedule when pressed for time. 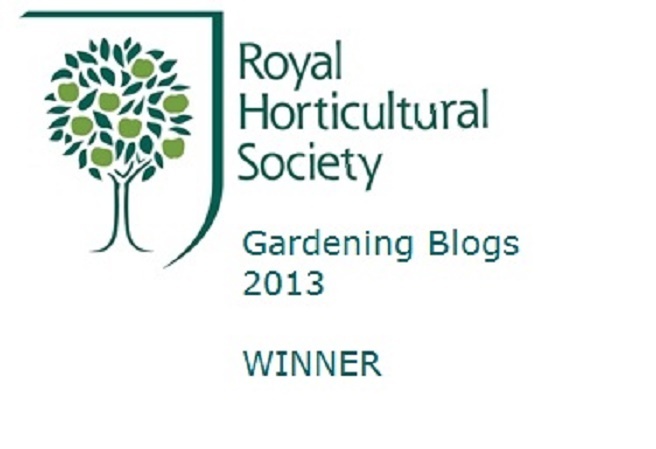 I did have big plans to tackle them last autumn but heavy rain and sloppy soil put paid to that. Perhaps this year. 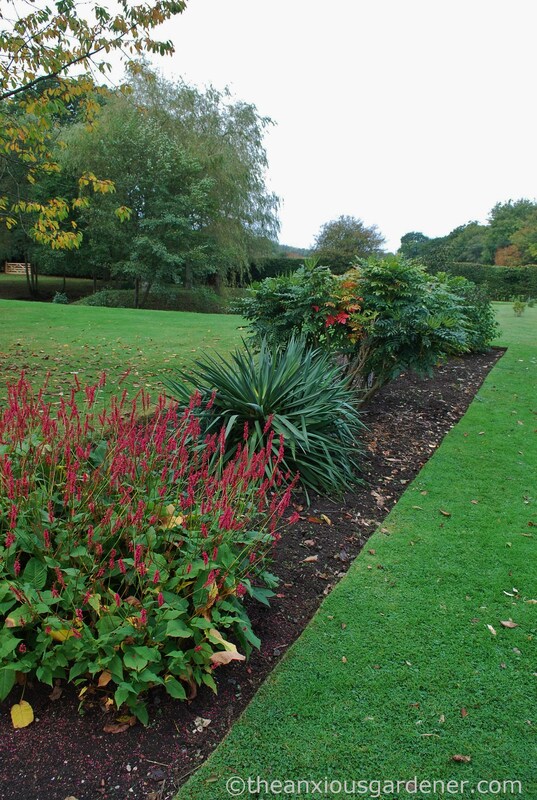 But despite their casual neglect they produce a lot of flower and colour – if the structure lets them down somewhat. 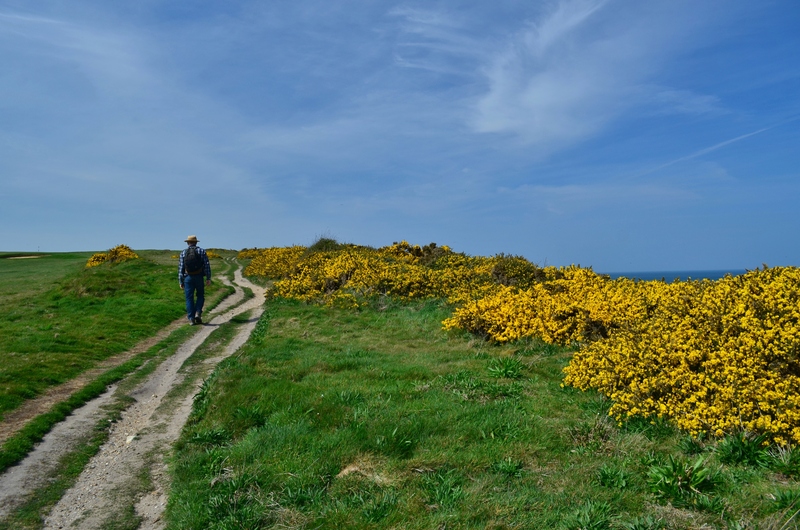 They’re definitely best viewed at a distance – let’s move on (before you notice the bindweed, dead-nettle, carex and bramble seedlings). 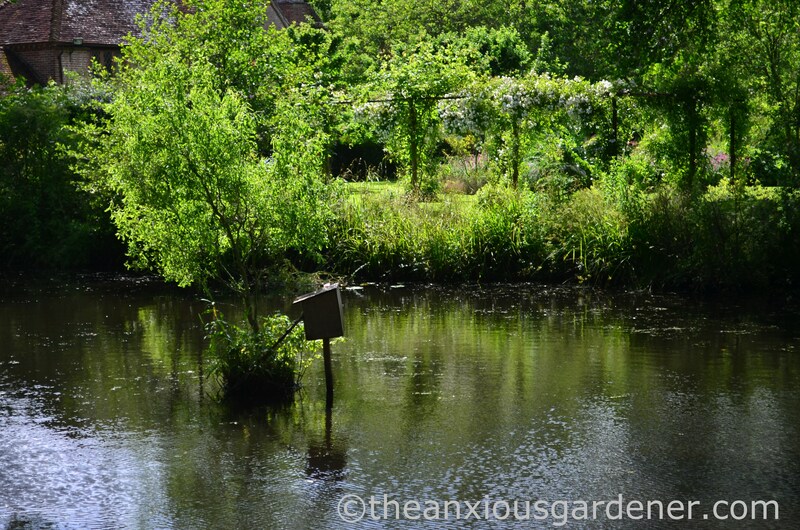 Turning away from the Kidney Beds, we’ll march smartly over to the east pond. 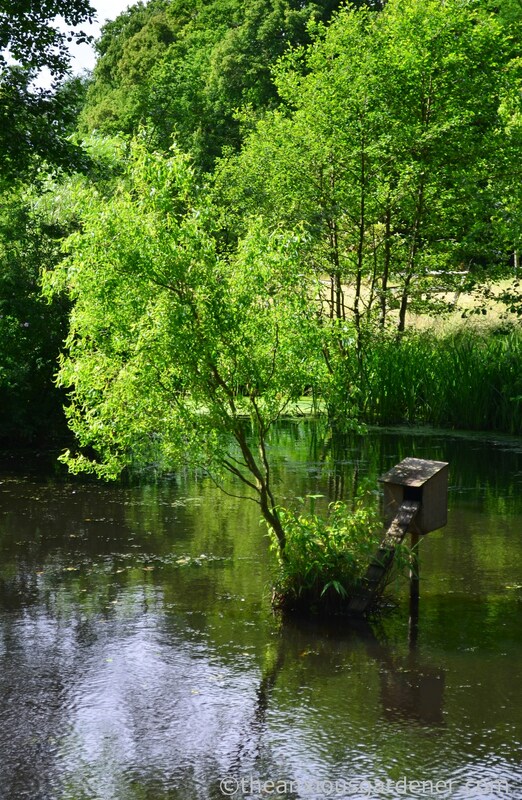 I planted a tiny corkscrew willow (Salix matsudana ‘Tortuosa’ ) on the island a couple of years ago (not so tiny now), built a duck nest-box and had big hopes for mallard ducklings. 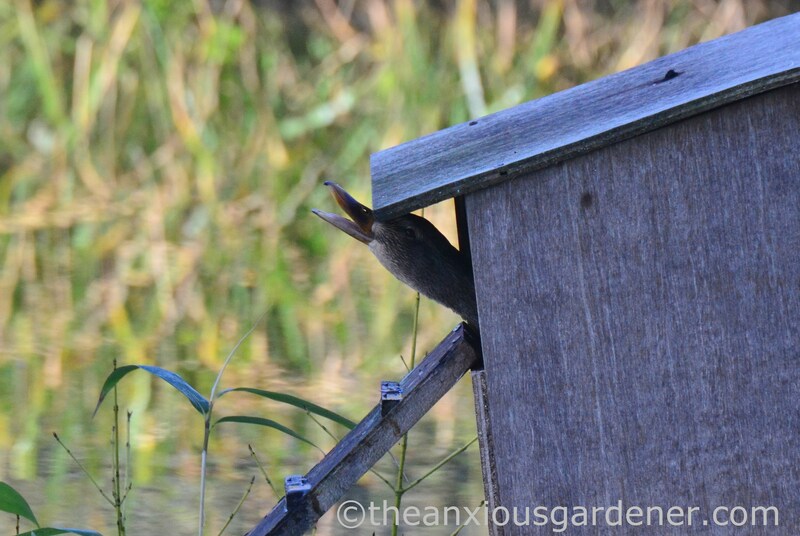 But despite some initial interest, we had no ducklings (unless they were eaten before I saw them). Perhaps next year. 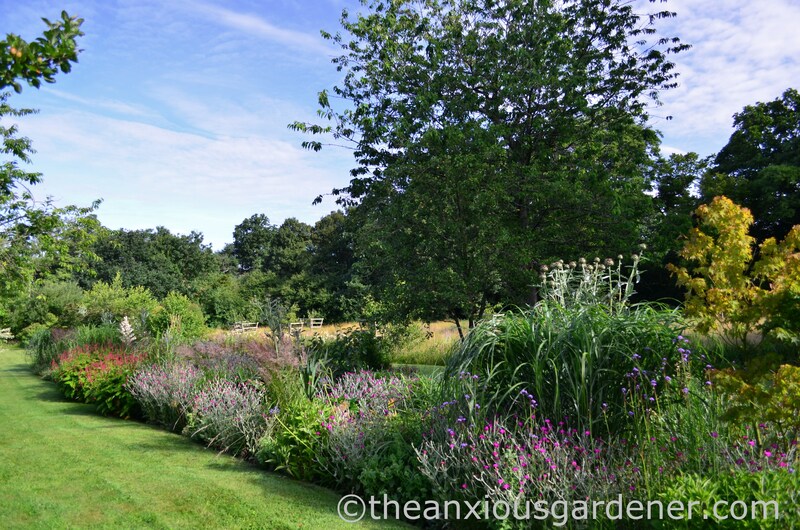 Across the pond is the rose tunnel and long borders which I’ll show you in a moment; but first we’ll cross over to the meadow. 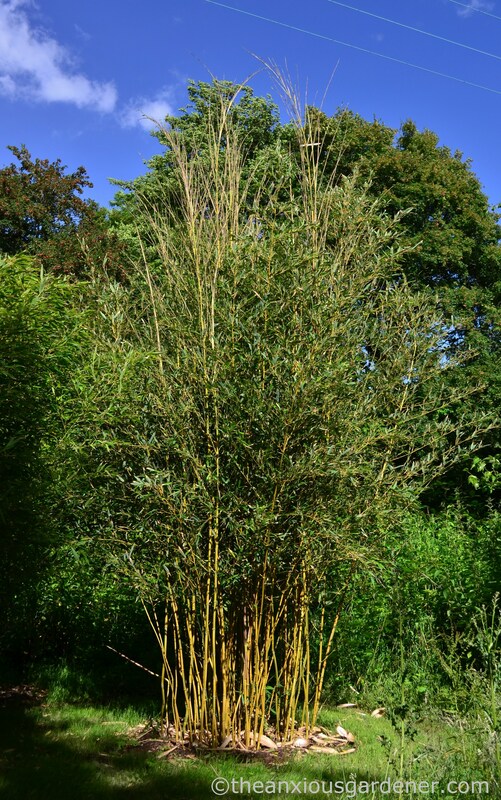 In a shady corner of this one acre-site are four bamboos including this Phyllostachys aureosulcata ‘Spectabilis’. It has thrived here, shot up to about fifteen feet and, with its companions, doing what I hoped: obscuring a power-line utility pole. 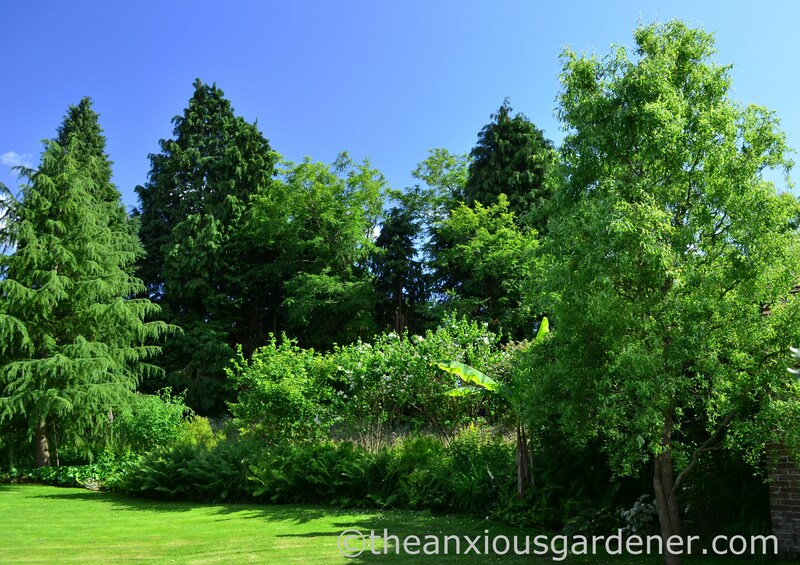 Spectabilis has lovely gold and green striped culms with a curious kinked habit, which I reveal by stripping away their lower growth. 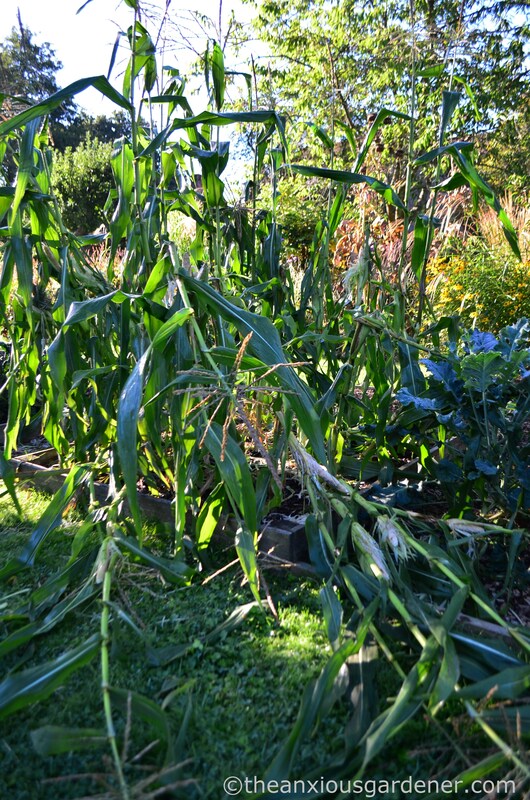 In autumn, I give all the bamboos a thick mulch of leaf mould or garden compost; and do so again in spring with a liberal dose of pelleted chicken manure. 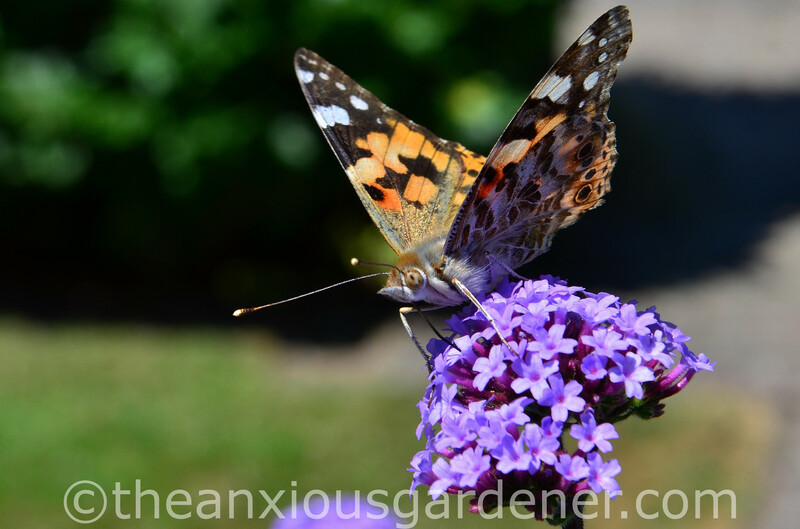 Now that they’re established, I only water them during very dry spells (much to the disgust of a family of field mice who hurriedly flee as their holes fill with water. Sorry mice). 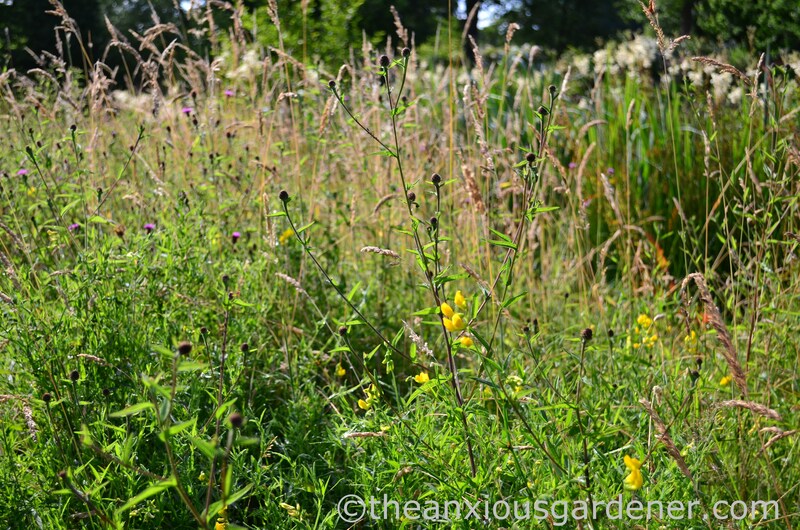 with knapweed, vetches and meadowsweet in flower. 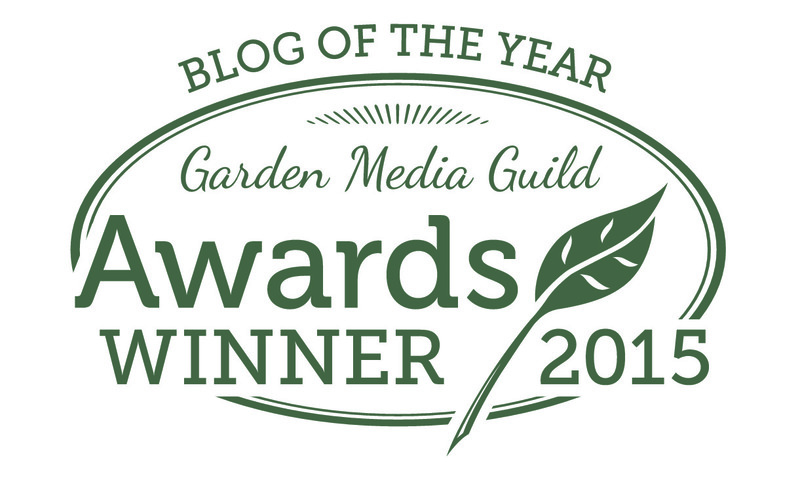 I must do a post about the meadow. 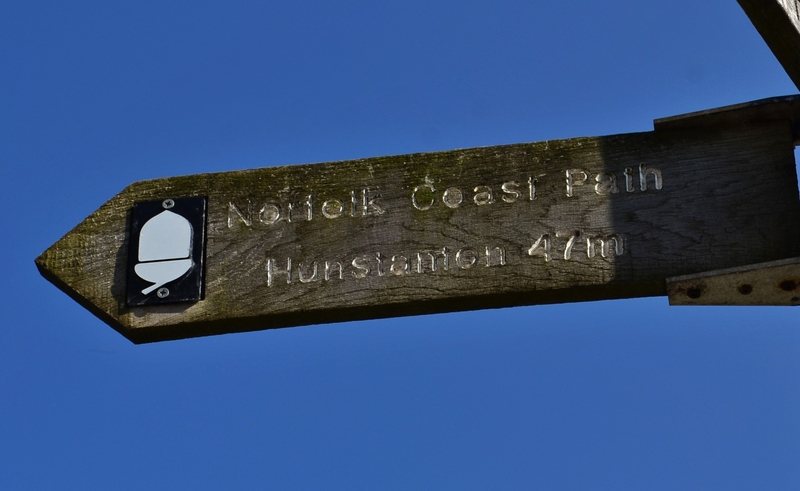 I’ve not mentioned it in a while and there have been some interesting, if slow, developments. Also on the meadow is a big disappointment. 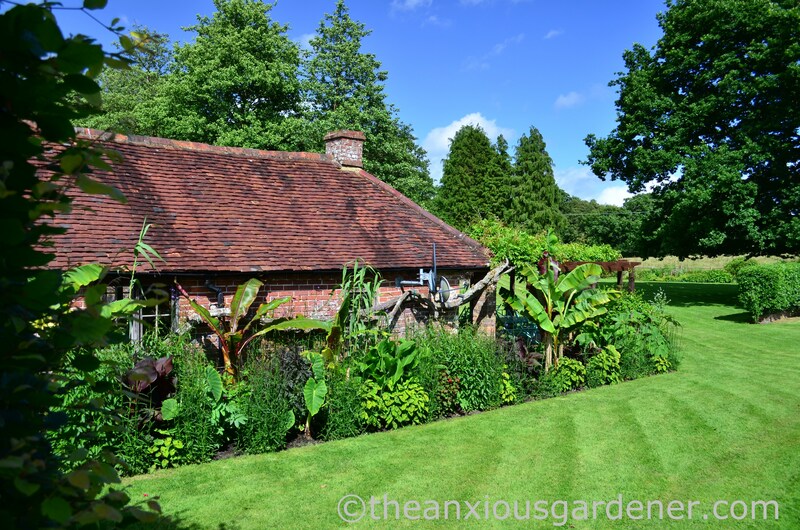 I transplanted a Gunnera manicata in 2012 and hoped it would thrive here by a ditch. It is healthy enough but of no great size despite my eternal hope that it’ll unfurl huge, silly sized leaves. Perhaps next year. I’ve taken to feeding this too and forlornly water it too, if only occasionally. I should do a post about it. 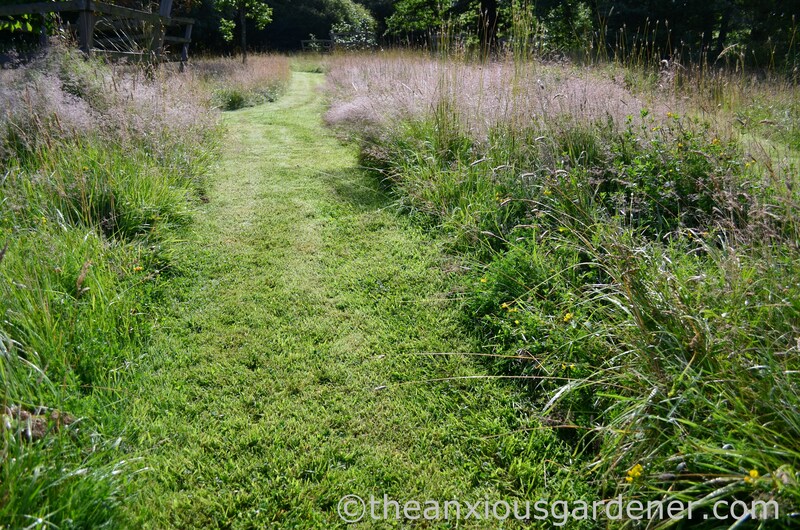 Leaving the meadow, we’ll cross a small foot-bridge and approach the vegetable beds, tucked behind the Long Borders. 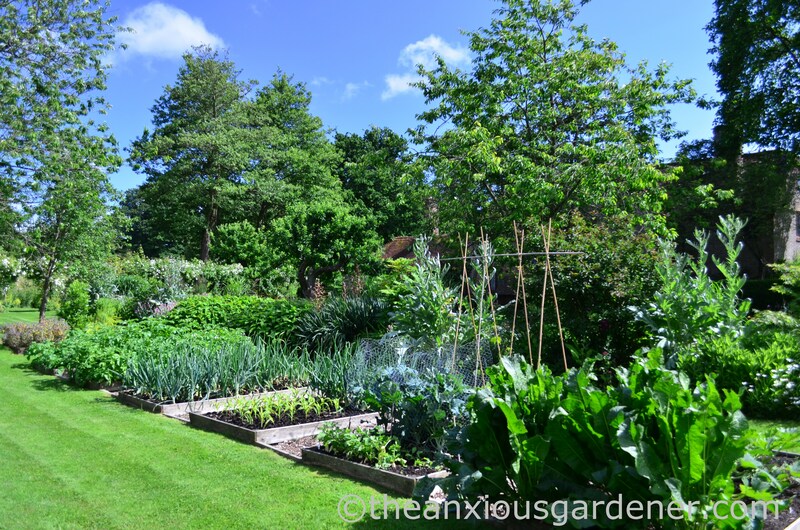 2016 hasn’t been my best year for vegetables: the new potatoes were good; French climbing beans excellent; onions tick, gold star; garlic a thudding failure; sweetcorn pretty damn fine; courgettes fairly rubbish; radish and salad leaves so-so. (When I say that my sweetcorn was “pretty damn fine”, I should add “right up to the moment when they weren’t”. Deer discovered my plants and boy, do they love the sweetcorn. They ate the lot, leaving me only two cobs – one of which they’d partially nibbled. As delicious as this one and a half bounty was, it wasn’t a bumper crop). 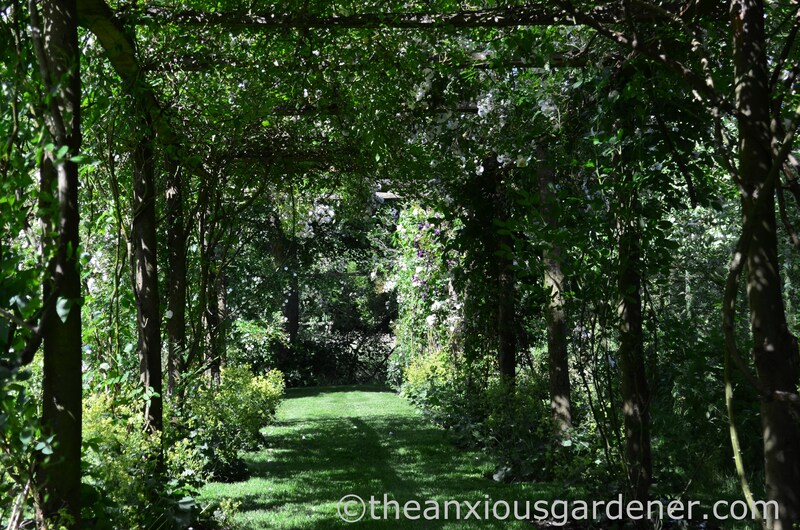 Beyond the vegetable garden is the rose tunnel. 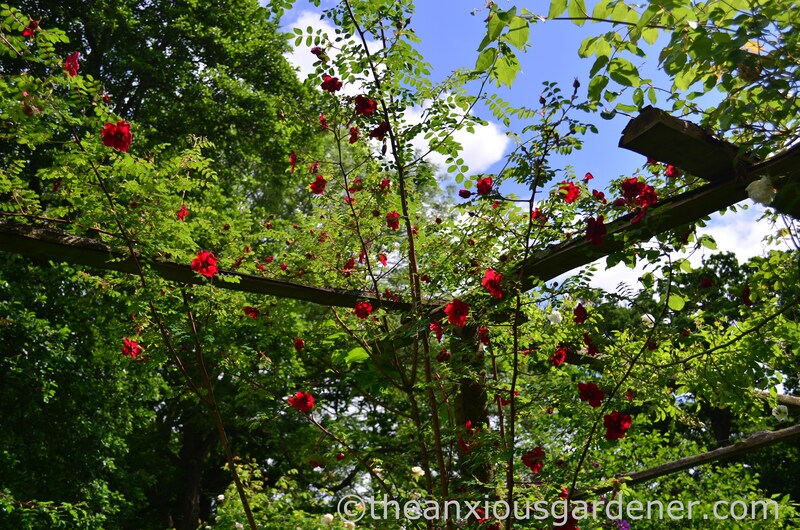 including the splendid Rosa moyesii ‘Geranium’. 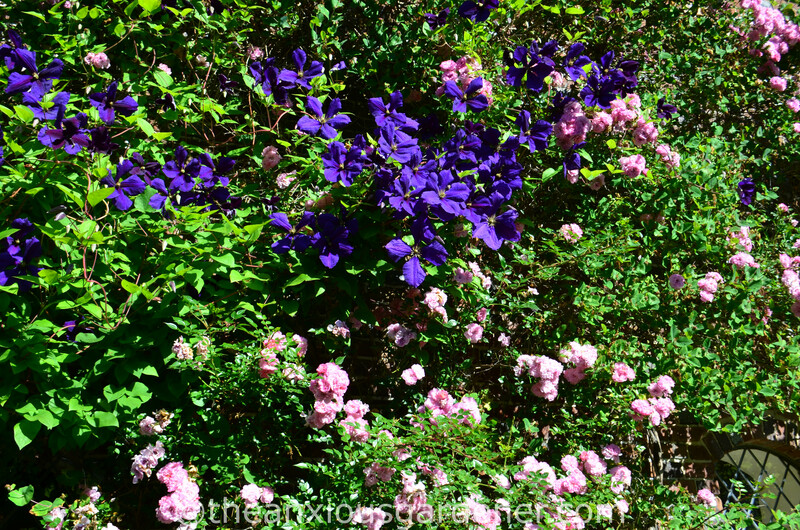 Its flower season is a short-lived pleasure but, I think, big moyesii warrants the space – if you have it. I really should do a post about the rose tunnel. I’ve found photos of when some of these Sander’s Whites were strimmed and mowed to ground level (by the previous gardeners) and it’s nice to see them back with a vengeance. Deer are a major annoyance here too and their repeated grazing on fresh stems has delayed the roses’ spread along the rails. Perhaps next year? In a hot July, working in the tunnel is a welcome escape from sun-block and sun-hat. (Alchemilla mollis fills the planting holes). 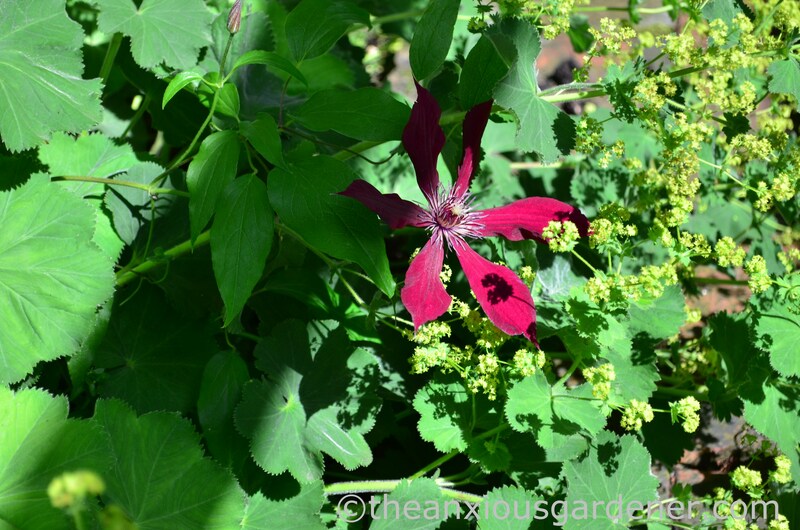 and I particularly like this new addition, Clematis ‘Empress Amy’. Finally, we’ll spin about and face the Long Borders. 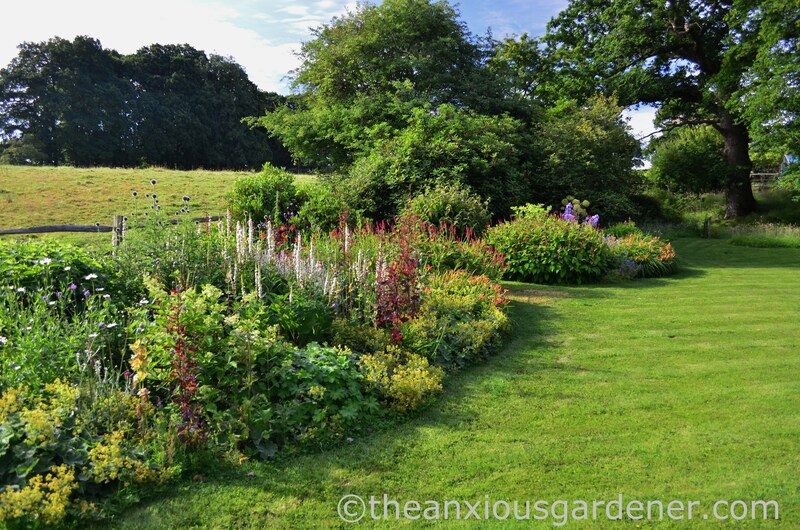 I re-cut these beds in 2009 and dug out a thick mat of weeds. 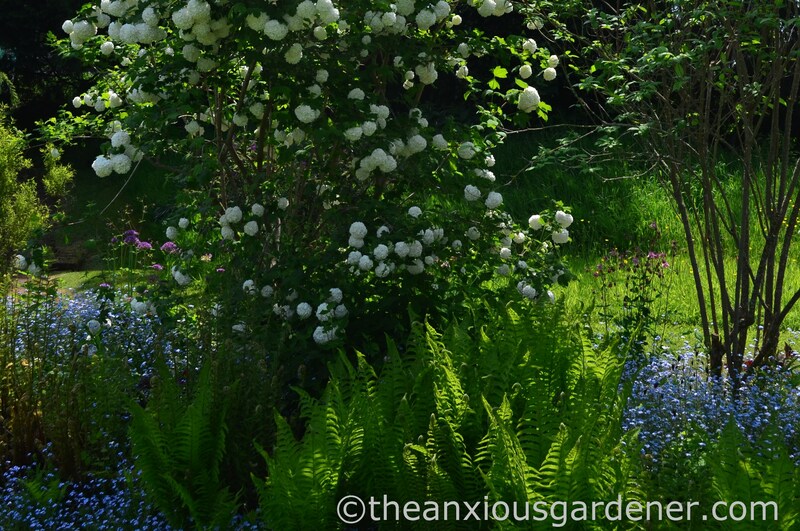 I’ve gradually planted them up over the years whilst experimenting with what was salvageable from years of neglect. (I really, really, really wanted to remove the yucca but was over-ruled). 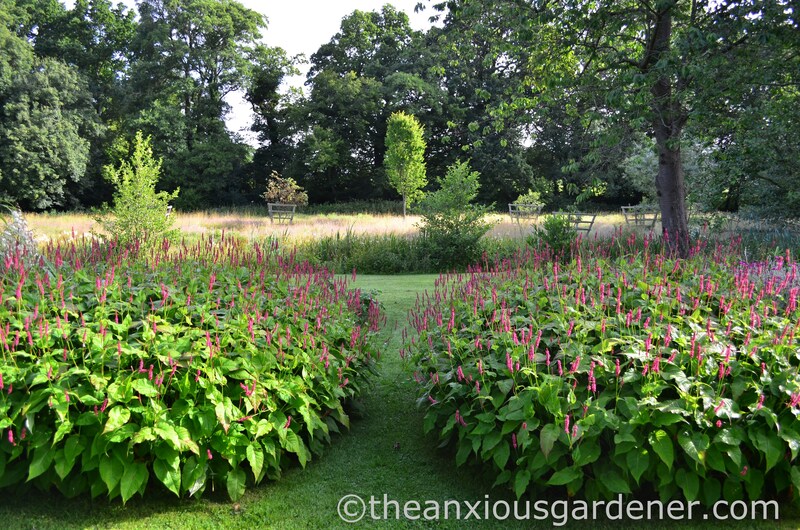 I’m pleased I kept the persicaria: long flowering and tough as my old boots. Over the past two or three years I’ve added several tall grasses and a pair of acers, at either end, which had outgrown their pots. I’m introducing height both at the front and rear of these narrow beds. Not sure why but it seemed like a good idea. 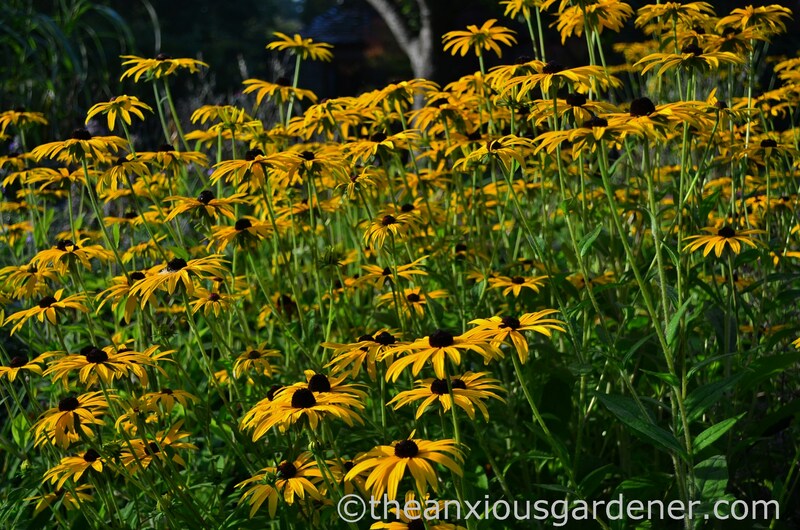 I’ll sign off with this up to date shot of the Long Borders in September showing a reliable stalwart, Rudbeckia ‘Goldsturm‘ (or if we’re being pedantic – Rudbeckia fulgida var. deamii ‘Goldsturm’) assuming late-summer flowering duty. A job it carries out rather well.